Families driven from their homes in Myanmar into overcrowded camps and others who have fled for their lives to neighbouring Bangladesh have been telling their heart-breaking stories to Islamic Relief staff responding to the crisis. Islamic Relief is providing food, shelter and clean water for thousands of people in camps in the western state of Rakhine in Myanmar. We are also gearing up our response to the crisis in south-eastern Bangladesh, where refugees from Myanmar were arriving at the rate of 15,000 a day in the first fortnight of September. Since the conflict in Myanmar dramatically reignited on August 25, over a thousand people have been killed and entire villages have been burned down. Around 120,000 people have been forced to flee their home villages within Myanmar, while 400,000 more have made the exhausting and hazardous journey over the border to Bangladesh. In Rakhine Islamic Relief is working primarily in a large camp called Ohtagyi near the state capital, the coastal city of Sittwe, in coordination with government authorities and the UN High Commissioner for Refugees. Already home to around 200,000 people, this camp is seeing numbers swell as it shelters newly displaced families. “It’s a heart-breaking situation,” says Islamic Relief’s Zia Salik, who has been helping to distribute food packs to families in Ohtagyi camp. “Many thousands of people are here because they were forced to flee their burning homes and leave behind everything they had. Some immediately burst into tears when we arrived for the food distribution, explaining that they hadn’t eaten for days. At every food distribution Islamic Relief provides hundreds of families with food packs containing 25 kilos of rice, seven packs of noodles and 3 kilos of lentils, together with canned fish, salt and oil – enough to last each family for two weeks. The needs are overwhelming, and more funds are needed to feed more people. Islamic Relief has built 50 sturdy shelters in the camp, each providing separate living spaces for eight families and enabling 2,000 people in total to live in relative dignity. Ninety more shelters are in the pipeline, and with additional funds we could build hundreds more. We also want to add to the 20 tubewells with hand pumps we have already installed to provide clean water in the camp. The Islamic Relief team heard about four men living in the camp who managed to escape to get food from the market. The group were spotted and pelted with stones by an angry mob. All four were severely injured, and one died of his injuries. “Our shelters are being built amongst the cement houses of families who have been in the area for decades,” says Zia. “These host communities are also effectively prisoners within the camp but their support for the displaced families is inspiring. 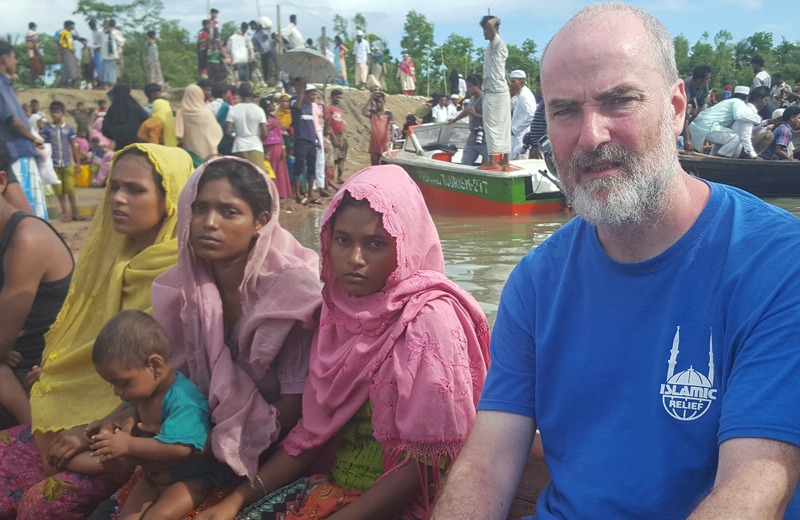 On a visit in mid-September Imran Madden, Islamic Relief’s UK Director, encountered thousands of refugees fleeing for their lives and saw plumes of smoke rising across the border from the homes in Rakhine state that people had fled. As part of an Islamic Relief needs assessment Imran travelled to the southernmost city of Teknaf, along the Naf river, where a dozen narrow wooden boats were collecting refugees from a river island where they had fled by night and dropping them on the Bangladesh side of the river. Among these refugees he met Muhammad Rafiq, his wife and four children who had fled their home as conflict erupted. Muhammad was desperately worried about his youngest son, Noyum, who was suffering from a fever and needed immediate medical attention. 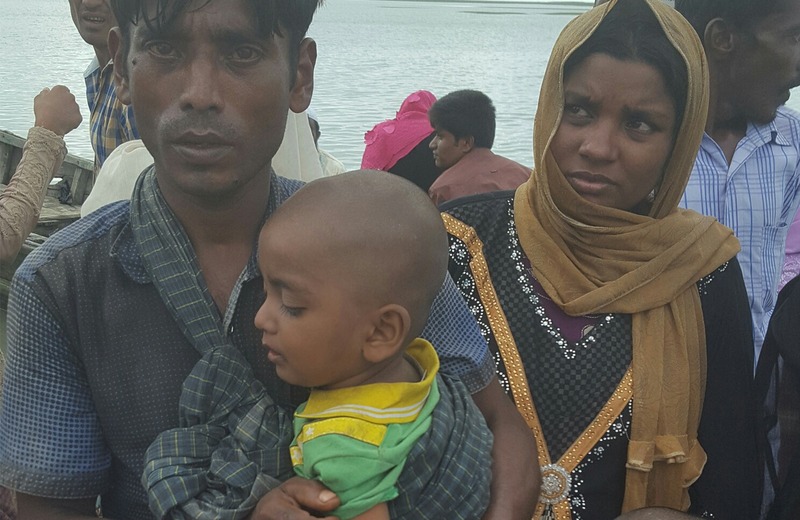 Further down the river, Imran and the Islamic Relief Bangladesh team met a small group of refugees who had been involved in a tragic boat accident overnight in which 12 refugees had lost their lives. They saw people walking along the beach carrying an open casket containing two bodies – the last of those who drowned to be found. Islamic Relief UK have launched an emergency appeal for Myanmar, please donate now and help save lives.